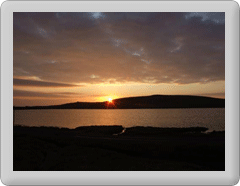 In common with most people today, Fetlar's residents are concerned by ever-rising energy costs and the effects of global warming. 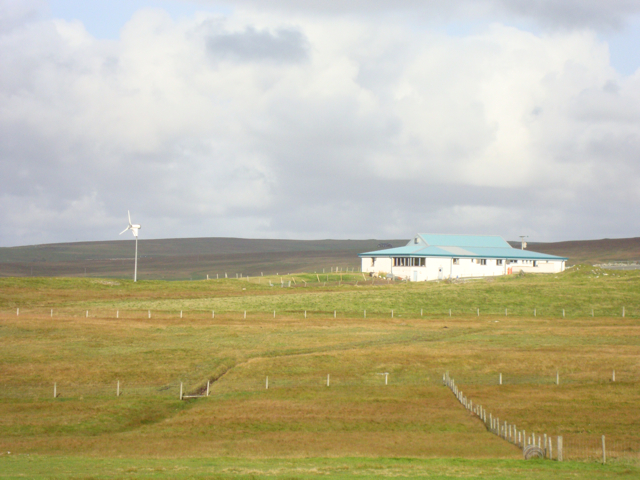 With this in mind, organisations in Fetlar have already begun to take steps to to reduce their use of imported energy, and also to reduce their energy bills. A lot of inspiration for our projects has come from our friends on the Island of Eigg, who are at the forefront in pioneering Eco friendly projects and who have won a number of major awards for their efforts. Zoom imageFetlar Community Hall and wind turbine The Fetlar Community Association (which is responsible for the community hall) has already installed a 6kw Wind turbine to reduce both heating costs and their carbon footprin. 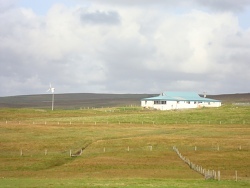 The Fetlar Museum Trust (which operates the Fetlar Interpretive Centre) has also installed a similar turbine to provide heating. In partnership with the Energy Saving Trust we are aiming to start a project to help people reduce energy consumption in their homes. Energy Saving Trust officers will conduct home visits to complete an initial energy audit and offer advice on energy saving measures. They will also highlight schemes which give householders help with the costs of upgrading insulation and heating systems as well as installation of heat pumps and renewables. Fetlar Developments in association with Fetlar Wind, who installed the turbines are installing a micro district heat and power scheme which will be fully commisioned in 2016. Offering significant carbon savings to connected properties. 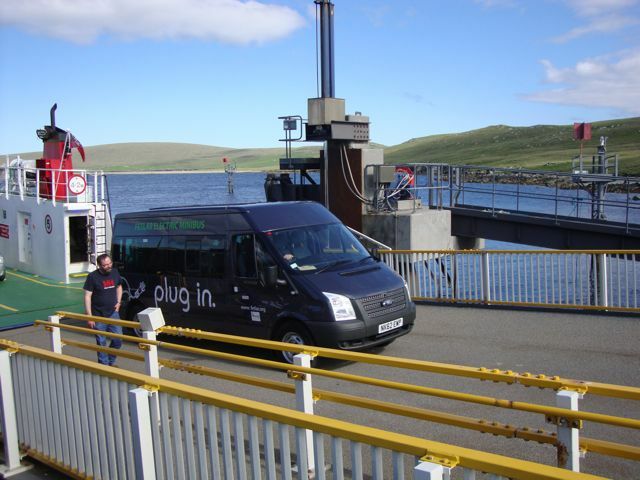 Three special charging points have been installed on the island as well as additional points on Yell and Lerwick, for the electric minibus. However the one linked to the new renewable powered scheme will be the primary charging point once it is commisioned. 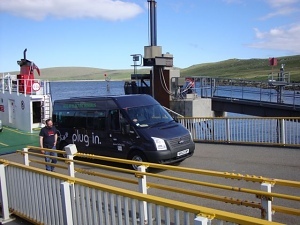 Fetlar Museum Trust have installed an electric vehicle charging point on the island. It can charge at up to 22kW three phase but can adapt to vehicles with smaller demands. Two connection points are available. The charging points are on the 'Charge your car' network. 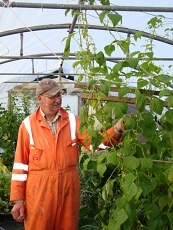 Zoom imageKenny Ritchie with his beans A few people on the island currently grow there own food, but not everyone has suitable space or in some cases any land at all. 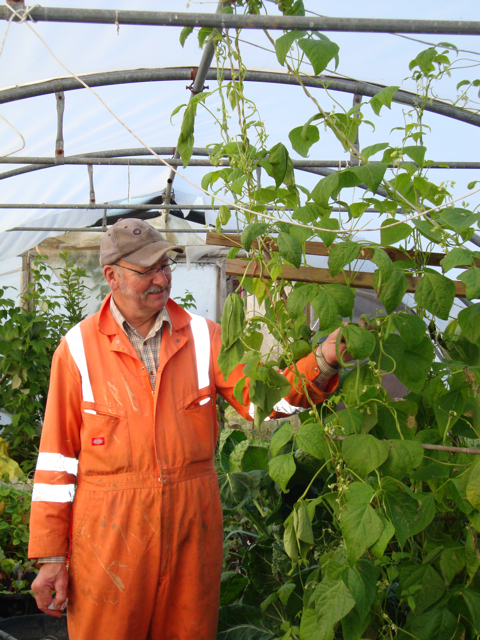 The Community is currently looking into a scheme to provide both outdoor and indoor areas for growing. This will have the effect of ensuring that all members of the Community have access to a place where they can grow there own and ensure their family has regular supplies of high quality fresh fruit and vegetables, while also reducing a significant number of "food miles". In conjunction with this project it is planned to introduce a community composting scheme to recycle as much food waste as possible. In 2013 Fetlar Developments Ltd took delivery of a fully electric Smith Electric minibus, based on a Ford Transit. This vehocle which isadapted for disable access now provides the "dial a ride" service and school transport on the island as well as being used for community transport. When from early 2016 it is charged by the new turbines, it will provide virtually carbon free operation.